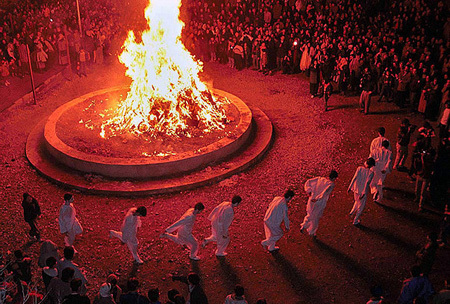 The "Sadeh" celebration is the largest celebration of fire and one of the oldest rituals known in ancient Persia. It is a festivity to honor fire and to defeat the forces of darkness, frost and cold. Until the Arab invasion of Iran in the seventh century, most Iranians in the powerful Persian Empire were Zoroastrians, who celebrated the feast at the start of the 30th January. The festival is held as a gathering of a city’s dwellers where a big fire is set. The observers help each other gather firewood, making the festival a celebration for cooperation and empathy between people. Today, the fires are not lit outside and all activities take place inside the shrines. The wood gathering activities are reduced though there are efforts to preserve them. However the bulk of the Iranians are becoming more familiar with the occasion. Current Zoroastrians recites various songs and hymns along with flames according to their language and culture. Also, in some areas, they also perform celebrations, games and group shows. Nowadays, the festivities of Sade is held sporadically in some cities and villages of Mazandaran, Lorestan, Sistan and Baloochestan, But in the most cities of Kerman and Yazd provinces, it is celebrated with magnificent glory.